The influence of technology on modern healthcare can’t be underestimated. Patient care has been improved by the application of new techniques to diagnose or treat a patient, new tools allow physicians to more easily get to the root of problems, and new communications methods have led to seniors being able to live independently for longer. #Electronic medical records (#EMRs) represent one of the most important technological advances in health care, for their ability to make a patient’s history more accessible, while still emphasizing privacy and security. How Canada Compares: Results from the Commonwealth Fund’s 2015 International Health Policy Survey of Primary Care Doctors, a study from The Canadian Institute for Health Information (#CIHI) gives an update on the use of electronic medical records in Canada, along with information about how easily Canadians can access health care when they need it and how well care is coordinated between providers. The Commonwealth Fund surveyed primary care physicians in 10 countries: Canada, the United States, the United Kingdom, Australia, the Netherlands, New Zealand, Norway, Switzerland, Germany and Sweden. CIHI’s report shows a big improvement in the use of EMRs by family doctors from 2009 to 2015. The proportion of doctors using EMRs increased from 37 to 73 per cent, due in large part to significant funding from provinces and territories with Canada Health Infoway. However, despite the use of electronic medical records having doubled over that time, Canada is still below the international average of 88%. Out of the 10 countries surveyed, only Switzerland sees less use of EMRs than Canada. 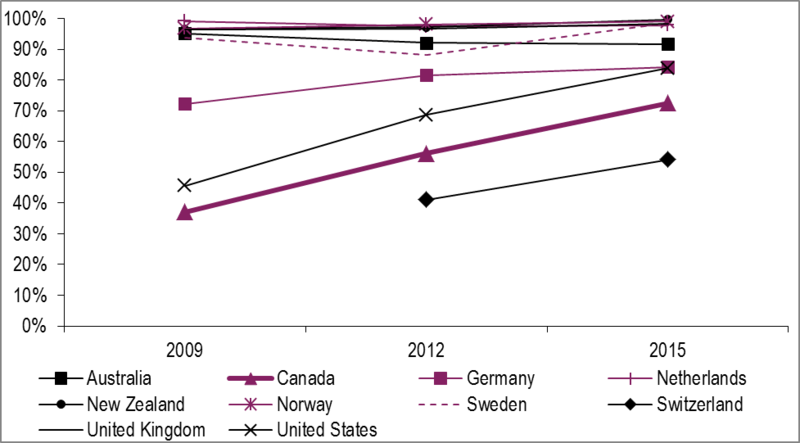 So, while few surveyed countries have experienced the same level of increased use, Canada still lags behind its peers. One of the advantages of CIHI’s report is that we can also see how the provinces compare, both to each other and to the international standard. With the exception of a few Western provinces, the adoption of EMRs is below the international average in Canada. B.C. Alta. Sask. Man. Ont. Que. N.B. N.S. N.L. Can. CMWF avg. The biggest benefit of EMRs on a patient’s care can be summed up in one word: efficiency. Having complete records of a patient’s medications, past diagnoses and treatments in one place saves the physician time and effort. That time can then be used to treat more patients more effectively. Accurate, timely information on a patient is of the utmost importance for a specialist meeting a patient for the first time, or for a family doctor seeing someone for the first time in years. It makes for a better foundation from which to diagnose and treat the patient, while reducing the chance of duplicated efforts or competing, contraindicated treatments. Finally, EMRs simplify the coordination of care between different providers, regardless of specialty, geography or relationship to the patient, by providing one common source of knowledge for anyone treating that patient. Why does Canada lag behind other countries? Despite the significant improvement in EMR use in Canada over recent years, the other 9 countries almost all have a higher use rate. The countries that are near 100 per cent use, and have been for some time, have long standing country wide legislation or an official plan surrounding EMR use. For example, New Zealand has a National Health IT Plan. Politics and geography are also factors, as Canada’s health care system is divided into the provincial health systems rather than a centralized, national system. Different provinces have taken to EMRs at different paces, for reasons that vary in each jurisdiction. For example, New Brunswick was behind other provinces in implementing EMRs because there was no established funding to roll out the new technology. Furthermore, it is undoubtedly easier to roll out such a program nationwide in the other Commonwealth Fund survey countries that are a fraction of the size of Canada. Using better data to make better decisions can lead to continually improving health care in Canada. The conversion of Canada’s clinical systems to electronic records represents a great opportunity to ensure decisions, from the highest level of Canada’s health system to the individual doctor, come from a place of knowledge. CIHI has a vision for how EMRs can help inform health decisions in the future. This important tool can play a very important role in improving the care of Canadian patients. Based in the United States, the Commonwealth Fund is a private foundation that aims to promote a high-performing health care system that achieves better access, improved quality and greater efficiency, particularly for society’s most vulnerable. Their annual survey results are a must-read, helping illustrate health trends in a timely way, from different perspectives. CIHI uses international comparisons like this survey to create a snapshot of how Canada compares on important health issues. You can find more broad information on international comparisons on CIHI’s OECD e-tool. It includes over 50 indicators on many different parts of health care, and allows for direct comparisons between provinces and more than 30 other countries. For more information on EMRs, or any other Canadian health issue, check out CIHI.ca.